When Mary Ellen Avery finally began to walk, at 19 months, her mother wrote, “Having discovered she could walk, she kept steadily at it.” That observation characterized the rest of Mel Avery’s life. From childhood on, she clearly had an outsized sense of self and purpose and a zest for new experiences that help explain the extraordinary list of firsts she accumulated: first to recognize the pathophysiology and cause of respiratory distress syndrome (RDS) in premature babies; first woman to chair the pediatrics department at McGill, head a major clinical department at Harvard Medical School, and become physician-in-chief at Boston Children’s Hospital; and first pediatrician to be president of the American Association for the Advancement of Science, the world’s largest multidisciplinary scientific society. She was the younger daughter of a former teacher and vice principal who left that career for marriage, and a canvas manufacturer who once encouraged her to take over his successful business. But next door lived Dr. Emily Bacon, the first pediatric specialist in Philadelphia. Bacon, who took her seventh-grade neighbor to the hospital, and even introduced her to her first preemie, steadily encouraged the girl to become a doctor—so when Avery entered Wheaton College, she majored in chemistry, graduating summa. She graduated from Johns Hopkins Medical School in 1952, one of four women in a class of 90, but within a month of becoming an intern at the Hopkins hospital she was diagnosed with active tuberculosis. Enforced rest led to an extraordinary interest in pulmonary pathology and her realization that the lung was far more complicated, particularly in premature infants, than anyone had understood. 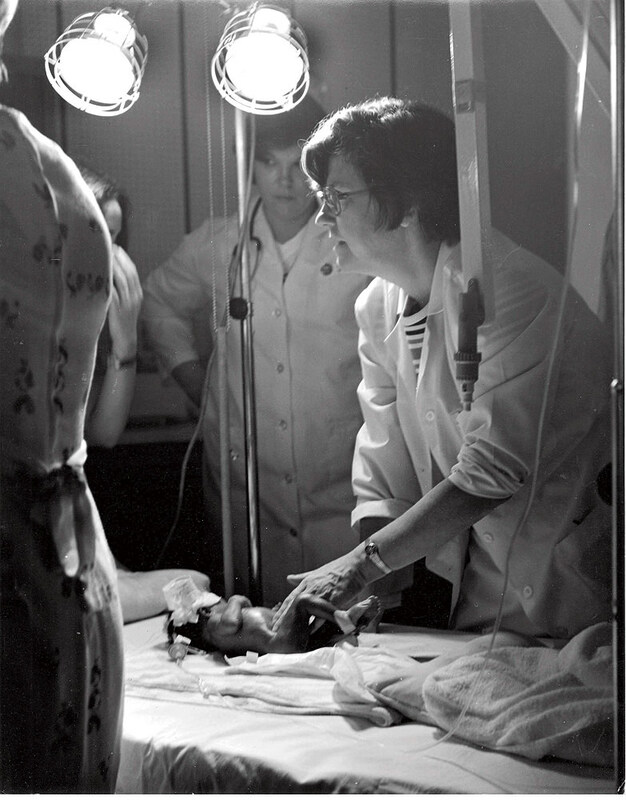 After nine months, she returned to finish her internship and residency, and then embarked in 1957 on a two-year research and clinical fellowship at Harvard’s Medical School and School of Public Health: her first chance to study the physiology and mechanics of newborns’ lungs and the crippling respiratory deficit found in the underdeveloped lungs of premature infants. Her research into what was then called hyaline membrane disease led to contacts with scientists and physicians from Harvard and MIT to England and Japan. Ignoring disciplinary boundaries, she looked into mixed insoluble films, pumps, foam, fluid and bubble mechanics, and other seemingly unrelated topics. She queried anyone who could contribute insights on any facet of the disease, and slowly assembled the puzzle pieces on her way to an extraordinary breakthrough. In 1959 she realized that a deficiency of a foam-like surfactant in premature babies’ lungs caused the alveoli to collapse, suffocating the infants; she and her mentor, physiology professor Jere Meade, then published the seminal paper on the cause of the disease. Once back at Hopkins, she reimmersed herself in patient care, teaching, and research until 1969, when—undaunted by her lack of facility in French—she became chair of McGill’s department of pediatrics and physician-in-chief at Memorial Children’s Hospital in Montreal. Boundless energy took her far beyond the city’s limits, too: she coordinated pediatric care for the Inuit of the eastern Arctic and pediatric education for a new medical school in Nairobi. Her return to Boston in 1974 enabled her to foster both basic and applied research as Rotch professor of pediatrics and physician-in-chief at Children’s. One early priority, a joint center for neonatology that included Children’s, Brigham and Women’s, and Beth Israel hospitals, lowered neonatal deaths at all three dramatically. Physicians and trainees recall a focused woman with a good sense of humor. She increased the number of women in her department (one trainee called her the first chief to allow a house officer to return after giving birth) and was heard to advise junior women faculty to attend national meetings and stand up, belt out their comments, and utter no more than three sentences—the attention span of the men in the audience. In retirement, she sought to aid “mothers of the world sharing a common cause that life will be good for their children.” Projects and consultations on RDS, oral rehydration, and children’s health took her to every continent except Antarctica. She even provided a recipe for surfactant to the Cuban Institute of Health. Honors continued: in 1991 she was awarded the National Medal of Science; in 2005, her honorary degree citation from Harvard read, “An eminent founding mother of newborn medicine, opening light on the genesis of breath, she holds nothing more precious than the life of each child.” Surely her own mother would have been astounded at what her slow-to-walk child had accomplished in one lifetime. Amalie M. Kass, author of Midwifery and Medicine in Boston: Walter Channing, M.D., 1786-1876, a lecturer on history of medicine, is former chair of the board of the Massachusetts Historical Society. Eleanor G. Shore ’51, M.D. ’55, RI ’68, M.P.H. ’70, is retired dean for faculty affairs at the Medical School and retired chair of the Women in Medicine Archives at Countway Library.